Sixteen-year-old Steven is absolutely positively not gay. Liking square dancing and having a slight attraction to the hot male substitute teacher doesn't mean he's gay, does it? Thinking he can't be gay, Steven takes some tips from a book on how to cure homosexuality. He sits at the jock's table at lunch hoping the masculinity will transfer to him. He goes out on some awkward dates with girls. He even tries some aversion therapy by putting a rubber band on his wrist and snapping it whenever he has inappropriate thoughts about a man. Needless to say, his wrist was really sore after a class with the substitute teacher. 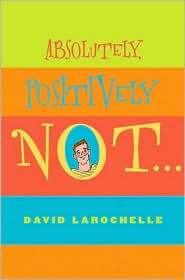 Absolutely Positively Not by David LaRochelle is a funny, touching coming out novel with a relatable teen. Steven has all the same fears of acceptance that most young adults have, and any teen, gay or not, will relate to his struggles. My favorite part of the novel is where Steven finally admits to himself that he is gay and then he comes out to his best friend and his parents. In many coming out novels this experience can be bad and negative, but Steven's experience isn't and I found that refreshing. I recently heard LaRochelle say a lot of people did not like that Steven’s coming out was so positive, and his reaction was, “Why does it have to be negative?” Exactly. One downfall of the novel could be that some of the situations that Steven gets into border on sitcom cute. When Steven takes an unconventional date to prom I started imagining this playing out on “The Facts of Life” with Natalie and the gang being in the same limo. But, since I grew up with “The Facts of Life,” I really enjoyed some of these sweet, simple situations, but sitcom haters may find some of this cartoonish or cookie cutter. Even with some of the sitcomishness, this lighthearted novel is really enjoyable. Steven is sweet and I was cheering for him while I laughed along with him. I personally LOVE stories where gay teens encounter good people. I get tired of the constant steam of depressing. There’s certainly plenty of that in real life, but there are also compassionate, good people. Not every gay teen experiences a horror story when it comes to telling family and friends, and it’s nice to see that represented too.